But before we start talking about threads, you need to know what is (and a bit about how it works) Ruby method cache. What is a Ruby global method cache? Depending on the number of superclasses in the chain, method lookup can be time consuming. To alleviate this, Ruby caches the result of a lookup for later use. It records which class or module implemented the method that your code called in two caches: a global method cache and an inline method cache. Ruby uses the global method cache to save a mapping between the receiver and implementer classes. The global method cache allows Ruby to skip the method lookup process the next time your code calls a method listed in the first column of the global cache. After your code has called Fixnum#times once, Ruby knows that it can execute the Integer#times method, regardless of from where in your program you call times . Now the update: 2.1+ there’s still a method cache and it is still global but based on the class hierarchy, invalidating the cache for only the class in question and any subclasses. So my case is valid in Ruby 2.1+. What invalidates a Ruby global method cache? How can I check if what I do invalidates global method cache? You can use RubyVM.stat method. Note that this will show only chanages that add/remove something. Changing visibility will invalidate method cache, but won’t be visible using this ,ethod. General methodology that I’ve decided to took is similar for single and multi threaded apps. I just create many instances of an element and execute a given message. This way MRI will have do a method lookup after each invalidation. It’s worth noting that in a single threaded environment, a huge number of new OpenStruct objects initializations can have an impact on a final result. That’s why initializations were benchmarked as well. This allowed me to get the final performance difference. Here you can see the performance difference. Except some spikes, the difference is between 8 and 16% and the average is 12.97%. Still, we need to remember, that this included 1 invalidation and few commands, so it doesn’t exactly simulate the real app flow, where you would not have a ratio near to o 1:1 between commands and invalidations. But even then, with a pretty heavy loaded, single thread app, that uses a lot of OpenStructs or any other cache invalidating things, it might have a huge impact on its performance. Even with 2 threads and when 1 of them is heavily invalidating method cache, performance drop can be really high (around 30% or even more). The overall performance drop for multiple threads that work and multiple that invalidate is around 23,8%. Which means that if you have many threads (lets say you use Puma), and you work heavily with OpenStruct (or invalidate method cache in a different way) in all of them, you could get up to almost 24% more switching to something else. Of course probably you will gain less, because every library has some impact on the performance, but in general, the less you invalidate method cache, the faster you go. The quite interesting was the combination 10:1. There’s almost no performance impact there (around 4.3%). Why? 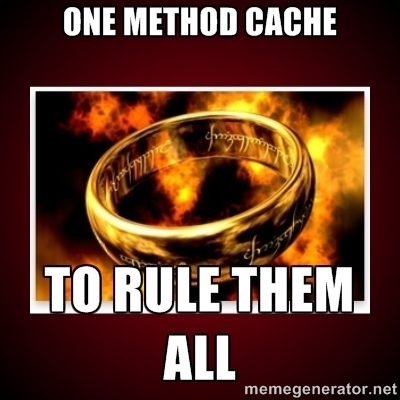 Because after the first invocation of a given method, it’s already cached so there won’t be a cache miss when using method cache. TL;DR: For multithreaded software written in Ruby, it’s worth paying attention to what and when invalidates your method cache. You can get up to 24% better performance (but probably you’ll get around 10% ;) ). Dragonfly is a great on-the-fly processing gem, especially for apps that rapidly change and need files processed by multiple processors (for example, when you need to generate many thumbnails for the same attached image). Since it is a on-the-fly processor, it has some downsides, and the biggest one, in my opinion, is keeping track of which thumbnails we have already created. There’s a nice example of how to do it using only ActiveRecord in the dragonfly docs, but unfortunately this solution won’t be enough for a heavy imaged website. Since each request for a thumb will require a single SQL query, you might end up having 50-60 and even more thumb related queries per page. Of course, they would probably get cached, so they would not take much time, but still, there’s a better way to do it. Memcached uses LRU algorithm to remove old and unused data, so no need to worry about it exceeding memory limits. Instead, we can focus on putting there our thumbnails details, and the more often we request them, the higher change there will be, that we will get a cache hit. We need to remember, then Memcached is an in memory data storage, so our data might dissapear at any point. That’s why it is still worth adding second ActiveRecord layer. Before we go any further, we need to tell our app, that we want to store cached data in Memcached. To do so, please follow Dalli docs instructions. Dalli is the best Memcached ruby client there is and it can be easily integrated with Ruby on Rails framework. You might notice a method called key. When working with Memcached, I like to prefix keys, so there won’t be any cache collisions (scenario when different data is there). Now, we can incorporate the code above into DragonflyCache model. That’s all. Now your Dragonfly cache should hit DB less often.